January ice. February snowstorms. March rains. April mud. 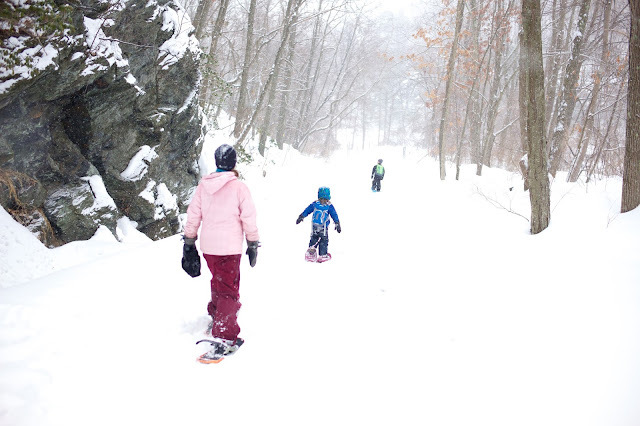 Winter and spring weather can make it challenging to get motivated for family adventures outdoors. And since we all want our kids to have the most positive experiences possible, sometimes when it rains or snows, we bag our plans and stay home instead. But wait! Hold that rain check! Below are some ideas to keep your kids playing in less than optimal conditions. And for when the truly nasty weather hits, we’ve got indoor ideas, as well. In rainy or snowy weather, make sure you’re adequately prepared with good rain or snow gear, plenty of warm layers, umbrellas, and a change of clothes in the car. The number-one factor in staying upbeat on cold and wet days is wearing the right gear. Keep bad-weather day trips short. Kids can endure less than optimal conditions and keep spirits high—but only for so long. After a couple hours, it’s just a slog. No one wants that. Bring a tarp and a backpacking stove. Go for a day hike in the rain or light snow, set up a tarp for lunch, and fire up the stove to make grilled cheese sandwiches and tomato soup—a recipe for happy campers. Hot cocoa in a thermos. Essential. Backup pocket chocolate also helps. My wife’s favorite childhood memory is of her father pulling out chocolate-covered marzipan on the ski lift. It kept them warm and brightened their spirits. Watch the weather. Never go out in lightning storms, blizzards, or strong storms of any kind. You can have a great time in a drizzle, but there’s never a need to put folks in danger. Indoor camping. Round up a couple of couches, coffee tables, chairs, blankets, or tarps and build a massive indoor fort. Set up pads and sleeping bags inside then read a book, take a nap, or watch a movie on the laptop inside your cozy nest. Top it off with a picnic in the fort while it pours or snows outside. Sardines. Hands down, the best rainy day activity, ever. Just like hide and seek except only one person hides, and everyone else breaks up and goes looking for them. When a seeker finds the hider, the seeker hides with the hider and waits for the rest of the seekers to come looking. One by one, the other seekers will eventually discover the hiding spot, and everyone ends up hiding together in a cramped space while one last seeker tries to figure out where everyone went. Great times. We usually play that the first person who finds the hider gets to hide next. Climbing gyms. Rock climbers hit these indoor training grounds to keep in shape during the off season or just during bad weather. Most climbing gyms have great kids programs and introductory lessons for beginners. A quick web search will help you find you a climbing gym within about an hour of most locations in the Northeast and Mid-Atlantic. Squam Lakes Natural Science Center, in Holderness, N.H. Great indoor exhibits and a New England-centric zoo featuring a coyote and mountain lions. Seacoast Science Center, in Rye, N.H. Awesome exhibits on marine ecology. Montshire Museum, in Norwich, Vt. More than 140 hands-on science exhibits. Museum of Science, in Boston. The big daddy in New England. Expensive but worth it. You can spend an entire day here and still miss things. Childrens museums. Excellent options for younger children in Boston; Dover, N.H.; and Portland, Maine; plus, many others to be discovered. “Planet Earth.” a TV show featuring mesmerizing cinematography of wild places and animals. You think you’ve seen everything, and then you see something on this show that blows your mind. We prefer the original British version hosted by David Attenborough, although there is also an American version. “Man vs Wild,” in which Bear Grylls gets dropped into wilderness locations without gear and has to find his way out to civilization. Outdoor sports videos on YouTube. From biking to rock climbing to freestyle skiing, there is something here to inspire every child. Guide You Outdoors. A YouTube channel full of educational videos about camping, knot tying, canoe camping, gear reviews, and general outdoor skills. AMC’s own YouTube channel features lots of great how-to advice and breathtaking time-lapse videos. Rainy or icy days are a great time to plan your next trip. Get out the maps, read a guide book, plot a route, buy tickets, and start organizing your gear. When the sun comes back out, you’ll be ready to go! Where to cross-country ski with kids: Wolfeboro, N.H.